Jor spat out the water and sand. He tried to stand up but his ankle screamed with pain and he fell back into the wet sand. He cried out, but the hunting party didn’t respond. How far had the river taken him? It seemed like merely a moment that he was in the water, tumbling through the rapid current before crawling out of the water. Gritting his teeth against the pain, he took stock of his surroundings. Behind him he heard the rushing water of the river that had swept him away from the group and a small cave in front of him. Jor got to his hands and knees and crawled toward the cave, careful not to hit his ankle. The dark inside of the cave helped sooth Jor’s nerves. Rolling over onto his back, he used his good foot to push himself to a sitting position against the wall. Examining his sore ankle carefully, he found it to be swollen but not bleeding. The other hunters would look for him along the side of the river. The small cave was unremarkable, with smooth walls and lots of rocks scattered about the small inside. It would be an adequate place to rest, protected from the elements until the others came. Fatigue finally overwhelmed him and Jor laid down on the hard rock and let sleep take him. A sudden, strange sound woke Jor out of his uneasy sleep, setting his hunter’s senses on alert. As he sat up, he heard the sound of falling rocks from the back of the cave. He looked around the cave quickly, but just saw the assorted rocks he had found when he entered the cave. Something set him on edge, though. He took a quick look at his ankle and noted that it was still swollen. Shifting around carefully, he crawled out of the cave into the dying light of the day. He pulled himself up on his good foot and looked around. In the far distance, he thought he saw a fire on the bank, upstream of the river. Perhaps that was the hunting party camping for the night. It was too far away for him to travel with his sore foot. Dropping back down to his hands and knees, he went over to the river to get some water and to relieve himself. He then went a bit upstream and found some edible plants for a small meal. The bitter, tough roots weren’t all that appetizing, but they took the edge off his hunger. It was as he crawled back toward the cave that he saw the moving pile of rocks. He blinked a few times, making sure his eyes weren’t playing tricks on him in the dusk’s light. The rocks suddenly collapsed on themselves, forming what appeared to be a small pile. Jor rolled away and into another pile of rocks nearby. He panicked and tried to scramble away, but ended up sprawled out on the sandy riverbank. In his peripheral vision, Jor saw the first pile pick itself up and move toward him. It was shaped sort of like a small man, with a body, head, and arms made of dark rock. The figure was easily visible, even in the evening’s light, against the sand. Jor rolled over on his side, facing the figure, hands up to repel an attack. The figure moved slowly toward Jor, and started rubbing its arms together slowly making a strange noise. From behind him, he heard the same sound from what was probably another rock creature near the cave. He watched as the rock creature got closer and closer while making the grinding noise. When the figure got close enough, it stopped moving and just remained where it was. Curiosity finally overwhelmed Jor and he reached out to touch the creature. The creature stood still for a bit, then it took its arm and touched Jor’s hand. The ends of the rock creature’s arms were blunt with crude fingers. 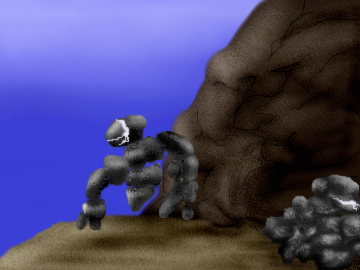 Another rock creature came up and stood by the first one. It held a stick of wood between an arm and its body and dropped it on the ground nearby. Picking it up, Jor turned it over and looked at it; it appeared to just be a normal piece of wood. He set it down again, and the second figure backed off. Then another creature came up and dropped some food mushrooms that Jor recognized. Brushing off the sand, Jor nibbled on the mushroom. He didn’t taste anything bad, so he ate it. The figures made different types of noises as he ate. Jor sat upright, avoiding putting pressure on his foot and looked around. There were four different rock creatures around him. Two of them were touching him, running their blunt arms along his skin. One tried to touch his ankle, but Jor swatted the curious arm away. Suddenly, the group fell silent. Jor looked around and saw all of them circling the first creature Jor had seen. It was holding one arm in the air and all were looking at it. The arm shook for a bit. Then the rock broke apart and formed into four fingers and a thumb similar to Jor’s hand. Wiggling the fingers, the figure waved the arm around to show everyone. The smaller rock creature then made a strange, quiet grinding sound that made the others stop and pay attention. Jor strained his hearing and heard something in the distance, a voice calling something out. Perhaps someone from the hunting party was coming! The rock creatures started making sounds again, faster than previously. After a few moments, they all went off away from the sound, following the river bank downstream. Jor watched silently as the creatures left him alone in the darkening night. “Jor!” he heard the voice call again. “Here!” he shouted. The voice got closer and Jor recognized the voice as belonging to the youngest hunter. “Gao!” he shouted. Joy overwhelmed him when the young man finally got close enough to see in the last light of the day. “Jor, you good?” Gao asked, dropping supplies on the sand and then setting up a crude camp. “Foot hurt,” Jor replied, quickly adding, “Cave there.” Gao gathered up some of the supplies and moved toward the cave. Jor crawled over and into the cave. Feeling around, he noticed that the rocks he had seen in there previously were no longer to be found. Unrolling some sleeping furs, Gao set them for both of them to sleep. “Han hurt from animal that pushed you in river. Not bad, moves slow,” Gao finally explained as he finished laying out the furs. Jor replied with a simple grunt of understanding. “You see anything?” Gao asked after dragging all the gear inside the cave. Jor stretched out on the furs in the darkness, fatigue coming over him again as the throbbing in his ankle started to subside. “Yes, but tired. Tomorrow,” he answered Gao as he drifted off to sleep. The fast one was the first one to move from his position overlooking the cave below. The group had been watching the strange creatures down near the sea for several days now, and a few of their group had come back with dead animals. The fast one had moved to get a better look at the scene below. The creatures seemed to move around a lot more now that the others had returned. They had the bright, hot fire burning well into the night, which made them much easier to see as they moved around. At one point the small creatures below started making a new noise, pleasant and kind of like listening to the sea with a certain rhythm and flow. The old one made a pleased noise. The small one echoed the soft noise immediately, as usual, and the rest followed suit. They carefully backed away from the edge as to not attract attention and found a group of nearby boulders to rest against. The next morning, the fast one was the first to start moving. He looked around to make sure there were no threats nearby and went off to explore a bit. Far away, near the far edge of the sea, there seemed to be a rock outcropping that looked promising. As the others started to move around, the fast one circled around them and then lead them toward the outcropping. The sun was high in the sky as they approached their destination. As they turned the corner, they saw a bunch of the violent green creatures. One of them turned and bared its teeth, waving its claws in front of it in an aggressive posture. The hard one advanced on it, making a low, rumbling noise to warn the creature away. It swiped its claws but they did little damage to the hard one’s rocky body. He started to push the green ones away forcefully, and eventually they took the hint and left the area. After getting a short distance away, the biggest green one turned and yelled harshly at the small group, then ran off into the distance. The fast one moved to the outcropping and made the questioning noise. The old one approached and looked around. After a bit, he made the negative sound; the rock would not be good to create a hole to live in as the other strange creatures had done. The small one made the disappointed sound as the group continued along the coastline. After a bit, the hungry one stopped the group to try to find something to eat. There was very little soil here, only sand that did not taste very good. The hungry one found a piece of wood to satisfy his hunger while the rest nibbled on nearby things. The water did not taste the same as the other water they had enjoyed before, but it helped cool their bodies down a bit. After everyone was done eating, or trying to eat, the group moved on. The darkness came again. The old one wished he could make the warm, bright fire like the other creatures did; it gave him a comforting feeling to remember it. The group found some rocks to rest between until the light came again. The small one was the first to start moving in the light of the next day, but he froze when he saw one of the large animal creatures prowling around. The prowler seemed interested in the group’s location. The small one made the alarmed noise and got the attention the rest of the group. They stood motionless, hiding between the rocks while keeping an eye on the furred one. It got close to the small one and the hard one was ready to make a move, but the old one made the negative sound to stop the conflict. This sound startled the creature, causing it to retreat a distance, look worriedly at the group, then run off away from the sea. The group got together and continued to travel along the coast. Four more days passed uneventfully until the group found another promising outcropping, this time noticed by the hard one. The group approached carefully, looking for any dangers in the area. After searching around a bit, the old one made a positive sound, and the whole group joined in. They had found the site of their current home. Now, they had to form the cave they would live in.